As sometimes is the case, national political campaigns are taking their lead from local politics and are addressing a topic that has been festering, at least in Elk Grove, for some time. That issue is, of course, the influence of big money in campaigns. Although the discussion of the influence of money in national politics has frequently been a topic covered by pundits and voters, this year the topic has taken hold with two legitimate presidential candidates - Bernie Sanders and Donald Trump. Sanders, the Independent Vermont Senator who is seeking the Democratic nominations, frequently spoken off the ill-effects of big money in politics. Sanders comments, while welcome in the dialogue, are not surprising given his ideological stance. The more illustrative comments about big money in politics come from The Donald himself. What makes Trump's comments piercing is that they come from his perspective as a frequent big-money contributor to both Democratic and Republican candidates. 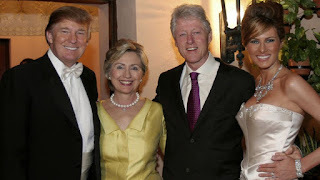 During the first Republican debate two weeks ago, Trump said if he donated to a candidate, or in the case of Bill and Hillary Clinton and their foundations, he expected something in return. Ever wonder why Bill and Hillary Clinton were at Trump's third wedding? What makes Trump's comments unique is that he confirms, from the contributor side no less, the long-held belief that a quid-pro-quo exist between politicians and the people and organizations who fund them. Of course, any self-respecting politician will swear up-and-down with a straight face that money has no influence on their votes. Needless to say, Elk Grove politicians are no different. We all know they vote in the interest of their contributors, not constituents. We could list all the contributions from individuals, developers, businesses and labor unions and how members of the Elk Grove City Council members voted to benefit those contributors, but we suspect most readers already know this. The dots are easily connected. With Mayor Gary Davis and Council Member Steve Detrick - the council's two most prolific fundraisers - presumably seeking reelection next year and Council Member Darren Suen seeking election to a full-term, it is our hope each will face a challenger[s] who will take-up campaign financing as a platform of their candidacy. It will be interesting to watch the debates to see how each man will answer questions on the influence of campaign contributors. As a bonus, it will also be worth seeing how the three of them use the threat of insurgent candidates to leverage their big-money patrons for yet more cold hard cash. The developers are filling the void left by the apathetic citizens in Elk Grove. No laws being broken, no corruption, just unsophisticated local politics: Let the developers keep turning dirt into money by voting yes on their projects, and you will keep getting re-elected. Just don't insult us by pretending to be leaders! Here is one honest politician for you. Elk Grove is just a small step up from being a podunk hick community. The city that is owned by the developers. Slap up the sticks and stucco during a severe drought?? ?